The beginning of Island of Wings may seem like a cross between a Harlequin romance and Hitchcock’s The Birds. 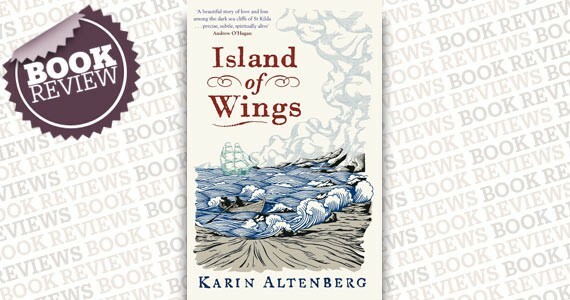 However, once over the minor speed bump, readers experience Karin Altenberg’s beautifully raw voice. Her poetic prose describes the Scottish archipelago St. Kilda, a treeless land where natives live communally in thatch-covered tunnels and survive off the seabird community. Although the setting seems otherworldly, it is based on actual historical events, including the arrival of Minister Neil Mackenzie and his wife Lizzie in 1830. Altenberg has tapped into her imagination to interpret the couple’s feelings and actions during their 11-year stint on the island as they attempt to “save” the indigenes. As the story progresses, Lizzie questions her husband’s beliefs, while Neil slowly loses his sanity. It turns out that he is the one that needs redemption. Save the beginning, Altenberg’s debut novel is triumphant in telling an addictive tale of an intriguing community now lost and of the most honest of emotions.